Ever since then, some people have been mystified by sine wave. To this day, 30-ish years later, different people still perform it different ways. From what I’ve read and heard, part of the reason for this is that General Choi didn’t do a great job of explaining sine wave when he introduced it to the taekwon-do world. He basically just said, Here’s this new thing you all need to start doing, now go do it. Everyone was left to figure it out on their own. It’s slowly been standardized over the decades, but there are still lots of people out there who just don’t get it (even though they think they do). To be fair, some federations may have different ways of teaching sine wave. If you know for sure that your federation’s technical committee teaches something different than what I’m about to explain, then take their advice. But if you’re doing sine wave a certain way just because that’s the way your instructor taught you, then at least entertain me for a little bit and read on. 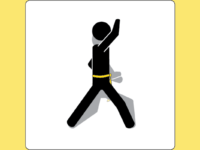 I’ve heard a number of people from outside Ch’ang Hon TKD talk about “that funny bouncing” we do during our patterns. I think that comes from the double sine wave that some people do. 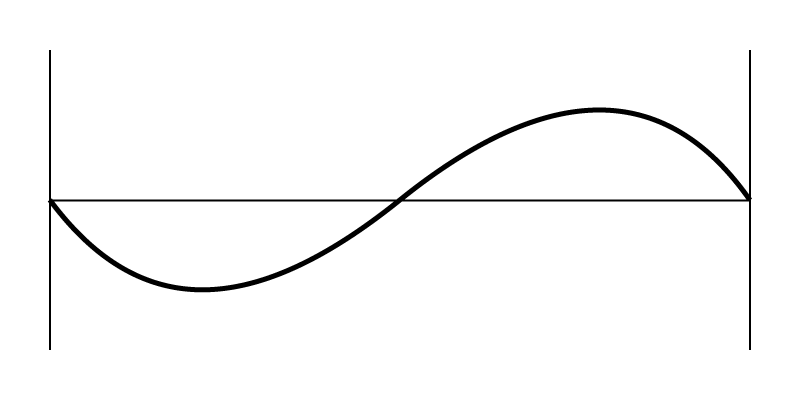 What do I mean by “double sine wave”? Well, let’s start by explaining a single sine wave. 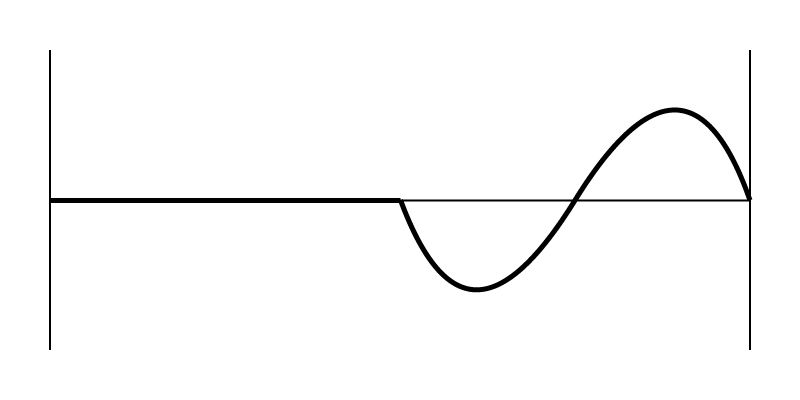 A sine wave follows a smooth curve down, up and then down again. From a stationary stance, we have to bend our knees slightly to move forward. (You can’t move forward without bending your knees. It just doesn’t happen.) But you don’t bend all the way before you start moving. Instead, you keep bending as you move. This is the down phase. Then we stand up tall as our feet pass one another, then drop into the next stance. Down, up down. In the article I linked to above, the author says that we should begin by following a flat plane as we move forward, then begin our sine wave. This is where the double sine wave comes in. If you’re trying to follow a flat plane, you first have to go down slightly as you bend your knees to put your body into motion. Then you have to come up again so you can begin the sine wave you meant to do. So you end up doing a small sine wave followed by a big one. A flat line into a sine wave, as the author of the article linked above thinks taekwon-do sine wave should be done (hint: no, it shouldn’t). A double sine wave: what really happens when you try to follow a flat plane before doing your sine wave. The diagram in the article I linked to isn’t accurate. There isn’t a flat line at the beginning. 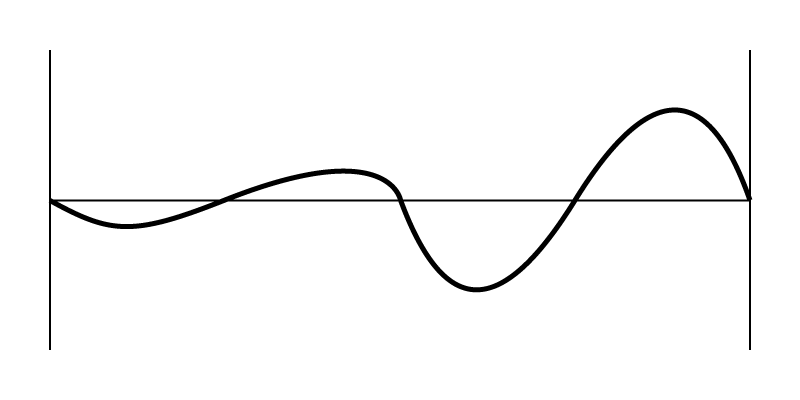 What’s more, if you try it this way, the second sine wave has to happen so quickly that it looks more like a sawtooth wave than a sine wave. Hence, funny bouncing. 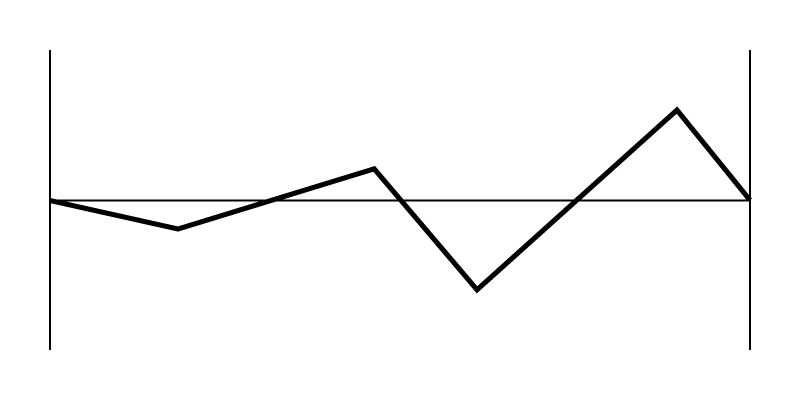 A double sawtooth wave. Because a double sine wave moves so quickly, it ends up being jerky and kind of like this. Trying sine wave this way also means using unnecessary motion. Think about it: the purpose of sine wave is to compress the knee joint to be able to smoothly stand up tall and essentially fall into the final stance. This can be done without waiting until the last instant to bounce—especially when you’ve already started the correct motion without even thinking about it. Here’s the correct way to perform sine wave. Performing sine wave. The downward motion starts as you move forward, not before or after. Note that it isn’t a perfect sine wave, but close enough. It doesn’t work out to a perfect sine wave, but it’s close enough for the name to be apt. Watch how multiple-time world champion Jaroslaw Suska performs his sine wave. There’s no bounce. There’s a noticeable sine wave, but it’s also not exaggerated. It’s just smooth, natural-looking flexion and extension of the knees, ankles and hips. This man is regarded as one of the best patterns performers in history. If anyone has sine wave down pat, it would be him. If you’re already doing sine wave right, kudos. If not, it will probably take a while to re-train your habits. But in the end, it will will be worth it—if only to get rid of that funny bouncing. I’ve been meaning to ask you about the sine wave for the longest time!! As you may know by now, my son attends a Kukkiwon school where the pattern’s aesthetic is more rigid, the stances tend to be uniformly high, and there is of course no sine wave. But I’ve seen ITF performances where the bounce is very exaggerated, and it looks really funny. Now for me personally, aesthetics is not the most important part of training patterns. I like to think of TKD patterns as a way to practice bracing the shoulders, hips, and spine in a good stable position while the feet and arms perform a variety of functional positions and movements, some of them requiring a high level of balance and flexibility (or “mobility” as weightlifters and physical trainers like to say). While many of the techniques themselves aren’t necessarily broadly used, the ability to brace while performing complex movements is highly applicable to everything we do; combat sports, non-combat sports, and daily life. Patterns contain a lot of the same broad functionality of gymnastics and weightlifting, but of course with far lower intensity, strength requirements, and risk of injury. But that long rambling rant being said, as an observer the main criteria IS aesthetics, and an exaggerated bounce just doesn’t look that beautiful to me. I’m glad you posted that video of Jaroslaw Suska — that demonstrates to me how you can have the up-and-down sine wave while still having wonderful aesthetics. That’s a really interesting take on patterns/poomsae. That makes me think I should ask some other people with experience in martial arts outside of TKD/karate, or with experience coaching other sports, what they think the purpose of patterns is. It would be fun to hear their takes. There are other theories on why patterns are important, but I think your analysis is also correct (whether that was intended to be the purpose of patterns or not).